It would be an understatement to say that this 70’s science-fiction flick comes bearing a message. If the grating voice of Joan Baez in the movie’s soundtrack singing about the beauty of nature weren’t enough to enforce the tree-hugging moral, consider the presented scenario: There are no more trees or plant-life on earth. The only existing vegetation exists in large domes that move through outer space attached to a ship manned by three very unsympathetic astronauts, three robot drones akin to steel-plated television box sets on wheels (accomplished by employing double amputee actors), and one very vengeful astronaut hippy responsible for maintaining the several eco-domes—barefoot, while wearing a cloak. In spite of Earth’s request to radiate the domes into oblivion, our faithful, friend of all furry creatures and is determined to save the forests. 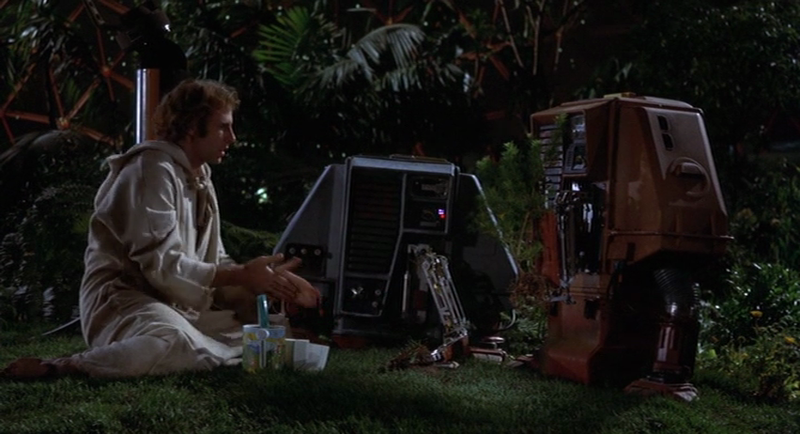 As retrospectively cheesy and over-simplified as this movie is, “Silent Running” carries such a strong “green-minded” stance that I would be interested what the writer would have done had all the information and understanding of global warming, oil dependency, and the global health dangers of genetically modified products were as present as they are now. Undoubtedly, this is what allowed stories such as “Children of Men” and “The Road” (the book, not the movie) to develop with such a keen focus on the present, providing a historically-relevant commentary through presenting a future based on a sensitive understanding of facts. Alas, we still have movies like “The Day After Tomorrow” that have full-access to an abundance of informed ideas and still manage to turn out as awful and senseless Hollywood flops. For the best cheesey 70’s sci-fi, I would continue to regard “Logan’s Run” as the brightly colored, polyester zenith. This entry was posted in Uncategorized and tagged double amputee actors, eco sci-fi, hippies, Joan Baez, Logans Run, Robots, Science Fiction, Silent Running, the 70's. Bookmark the permalink.